Whenever the Corp takes at least 1 bad publicity, access 1 card from HQ. "Flint? He's a burnout. A useless, alcoholic waste of Department time and money." -Louis Blaine, NAPD Detective. 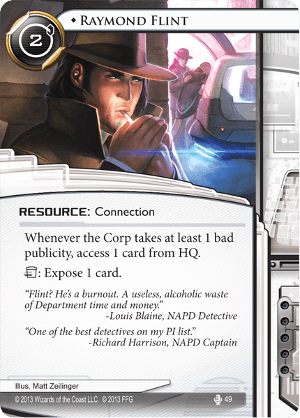 "One of the best detectives on my PI list." -Richard Harrison, NAPD Captain. This is a complex card. The reasons you'd include him in your deck are also complex. His other ability, (trash for expose) is more likely to be useful. But there he competes with Infiltration, which is not only zero cost, but can be used to GIVE you money, if you don't want the expose. So why would you use Raymond if you're not planning on bad publicity? 1: He's a connection. If you're building a deck around connections, (probably because you want to use Calling in Favors) he serves brilliantly. 2: If you're using The Supplier, he's effectively free, at the cost of telegraphing your ability to expose. 3: He doesn't cost a click to use. This part is really where he proves his worth. You can put him on the table when you have a free click, and then later, if the corp puts down something that might be an agenda, and might be a trap, you don't have to spend a click exposing it. You can just check, and then if it IS an agenda, dedicate all 4 clicks to getting where you need to go. He's an interesting card, and he definitely has his place. And if self-inflicted bad-pub ever becomes too common, he'll be a good counter. For now though, he really only fits into a few very specific plans. But for those plans, he's really quite good. This card is probably overcosted, but I was actually happy to see it at a casual meetup today whenever it showed up. I was playing Armand "Geist" Walker: Tech Lord with Tech Traders (as one does), so the install cost was basically mitigated by the draw + traderbuxx. Against an Argus Security: Protection Guaranteed supermodernism deck, the "on bad pub" ability was surprisingly relevant. In my next game (shell game PE), he was useful for avoiding Snare!. Afterwards, my friend pointed out that the threat of expose is probably more useful than the actual expose effect While you might use it to suss out a trap or avoid a nasty face-check, leaving it on the board tells the corp "your ability to bluff has been compromised." Hiding an agenda in a handful of installs is much less tempting when the runner can check one without risk or spending a click. I don't think I would build around it, but if you have a deck that plans to give bad pub, uses Off-Campus Apartment for draw, Calling in Favors for econ, or abilities for their side-effects, it's far from the worst card you could consider. I keep trying to make this card work with a Valencia Estevez: The Angel of Cayambe bad publicity deck, but there are very few efficient ways to lay down the condition. Combine this with HQ Interface and a few viable bad pub generators, though, and you have a way into the corp's hand without even needing to run. Can be a surprise masterstroke, but at the moment it's still too clunky to count on.